The car’s name was Ziggy, but it didn’t come from Mars. 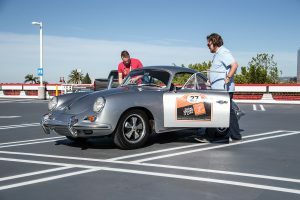 It came from the Southern California garage of Marty Fiolka, who graciously loaned Automobile this 1964 Porsche 356 C, which has been in his family for decades. Arriving at Fiolka’s garage to pick the car up, the color combination—pretty in photos–was gorgeous in person. Fiolka has enjoyed keeping the car in his garage since he picked it up from his father on the way to Porsche’s Rennsport Reunion at Mazda Raceway Laguna Seca in 2015 and, most considerately, treated the car to a complete once-over before handing us the keys. That was a good idea, considering Ziggy was about to be treated to roughly 600 miles of California back roads as part of Drive Toward a Cure, a charity rally organized by Southern California-based automotive PR professional Deb Pollack to benefit Parkinson’s disease research. In addition to accumulating miles on the road, the tour–consisting of 36 collector-grade cars—would raise approximately $25,000 over three days for the Michael J. Fox Foundation. The Rally consists of two groups that start on opposite ends of California and meet in the heart of the picturesque Paso Robles wine country. 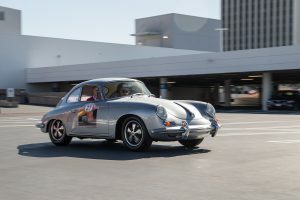 While the northern contingent met at the Blackhawk Museum in Danville, some 30 miles east of San Francisco, our Southern California-based group set off from the Petersen Automotive Museum early on a clear Friday morning in May. 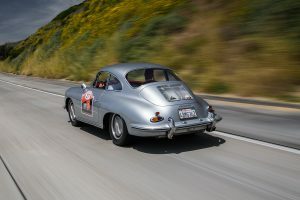 Being a tour and not a timed event, entrants made their own pace through the twists and turns of the best canyon roads in the Los Angeles area on the first leg of the voyage. It was here that the first glimpses of the 356’s brilliance began to show. When the 356 was introduced by Porsche in the early 1950s, it was dubbed the “giant killer” for its ability to keep pace with cars of larger stature and engine displacement on the international racing scene. The car’s rear-engine, rear-drive layout and air cooling meant that servicing the car was simple – important when faced with a breakdown mid-race. 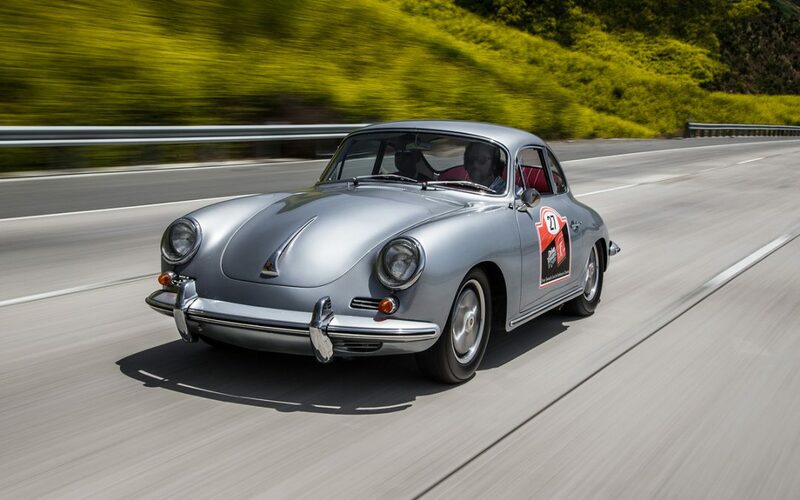 However, robust German engineering and a relatively simple flat-four boxer engine meant that 356s were often quite reliable–as Fiolka’s certainly proved to be even with over 400,000 miles on the odometer. While early cars started with displacements as small as 1.1 liters, by 1964, the 356 was in its final ‘C’ iteration and engine capacity had been increased to 1.6-liters (and a full 2.0-liters in rare, four-cam competition spec). Indeed, the new 911 was about to be released and the C-series cars represented the final bow for the 356 model line. 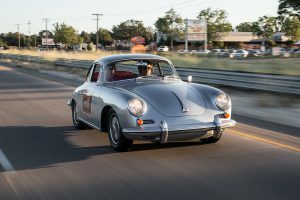 With about 75 horsepower rasping away behind us, the 356 isn’t a terribly quick car, but it’s more than capable of keeping up with modern traffic flow as we make our way up to The Mullin Automotive Museum for lunch. It also sounds superb and is easy to drive, with excellent feel to the slightly stiff clutch pedal and strong brakes (all C-series 356s got discs at all four corners). Steering behind the huge, leather-wrapped wheel is delicate, with only a light touch needed and plenty of road feel transmitting through the thin-diameter rim. As previously mentioned, Ziggy wears 15-inch Porsche 911 Fuchs alloy wheels and takes advantage of their slightly wider size with Pirelli’s re-issued CN36 Cinturato tires in a 185-section width. The tires make it easy to keep momentum going through twistier sections of road with more grip than 75 horses are able to break loose. The ride is shockingly comfortable, meaning that after three days of driving we still don’t feel beat up—and we certainly don’t find ourselves looking for a more modern conveyance. That also means that there’s a bit of body roll through turns, but that makes Ziggy’s limits all the easier to ascertain. By the halfway point in Paso Robles, Ziggy is running even better than ever–the miles of driving are surely good for his soul and we delight in following a rare, V-8-powered Daimler SP250 and a Sunbeam Tiger for quite a few miles on our serpentine, northern route. Even though the pace is nowhere near what these cars are capable of, it’s easy to get a sense of what it might have been like to drive a 356 in the Targa Florio or the Mille Miglia. While the 356 is by no means a large car, the packaging is very efficient and interior space for driver and passenger is ample. Medium-sized rollerboards containing a few nights of clothes for driver and passenger fit easily on the rear seat and there’s yet more storage space in the front trunk. 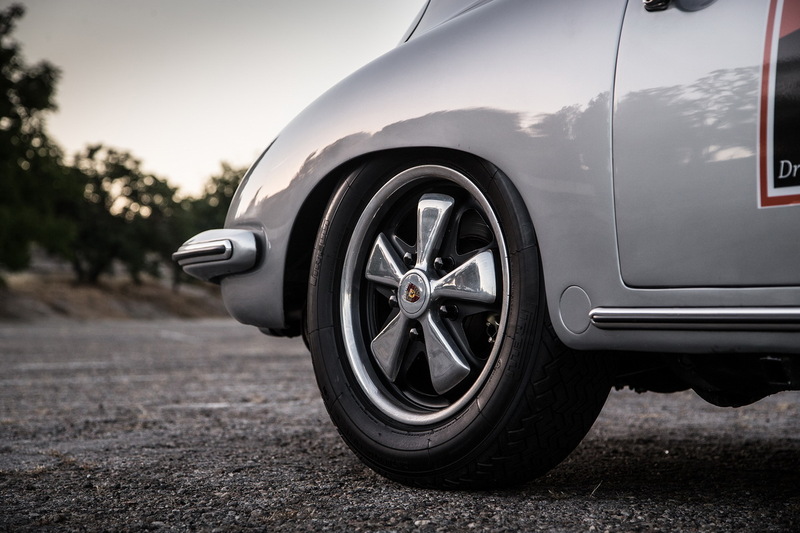 Because the 356 is so easy to drive, so comfortable and compliant on the road, it makes the car an excellent choice as a classic that is able to be used as intended on today’s roads. In fact, there’s really no reason why you couldn’t press a 356–the youngest of which is over 50 years old—into service as a daily driver. It’s that good, even today. After three days of excellent roads, people and comradery on the Drive Toward a Cure rally, Ziggy easily earned a spot on the short list of cars we’ve been reluctant to return to their rightful owners. For more information on the Drive Toward a Cure rally and to participate in the next event, visit www.drivetowardacure.org.